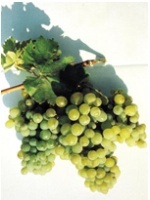 White grape variety mainly grown in the areas of IGP Lisboa, Tejo, Península de Setúbal, Beiras and Transmontano. This is a grape variety of medium-strong vigour, generating some interest due to its capability of adapting well to its rootstock.These grapes are well-suited to mechanical harvest, provided they are harvested at temperatures below 25 degrees. Particularly produces fresh, young and light wines. However, this grape also has the capacity to produce quality wines (when blended with Arinto and Sercial to provide more structure), creating wines of medium-body with pronounced fruit that are well-balanced and delicate when young. When oaked, creating wines capable of improving with age.